This is our Little Yorshire Terrier Christmas Jingle. He has a sweet face and happy personality. Jingle is 13 weeks old and 2.6 lbs. His double black and tan coat is very dark coat. 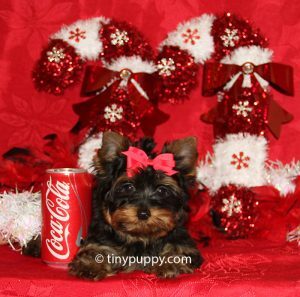 Snuggle up by our little Yorkie Jingle, and let this little boy enjoy some belly rubs. AKC Championship bloodlines! Puppies may be reserved with a non-refundable 25% deposit. 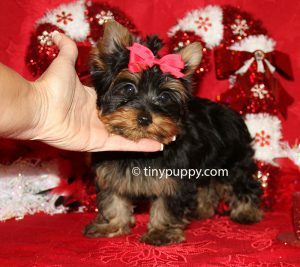 All puppies that are picked up at our place are sold with 8.25% sales tax. 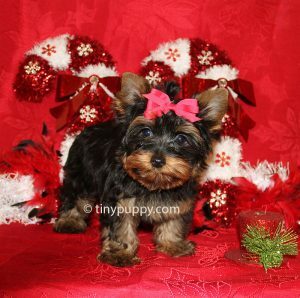 We do not charge sales tax for puppies that are shipped out of state.